Boardwalk by the Old County Dock stretched longer than a mile a century ago. It hovers over scores of cypress knees, and over the boardwalk fly all these butterflies: Monarchs, Spicebush Swallowtails, Cloudless Sulphurs. Image from Harriet Beecher Stowe’s book Palmetto Leaves, 1873. 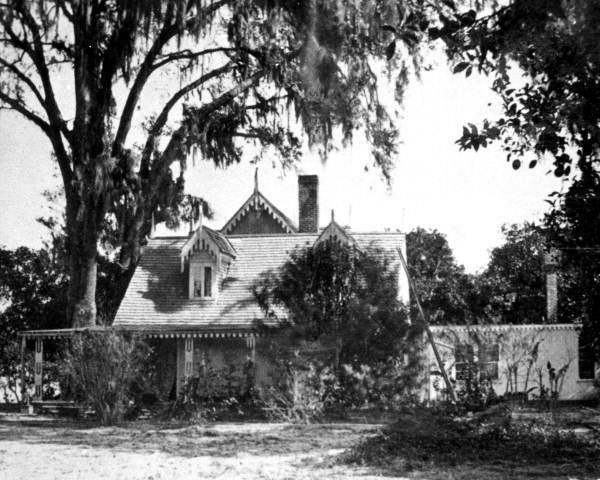 The small metal-roofed farmhouse appears through the trees, its veranda a sweeping L-shape hugging the front and the side of the house. In the back, the kitchen, separate from the house to keep at length servants and fires. Behind the kitchen, the servants’ quarters all eaten up with time since 1875. Elsewhere on the Webb farm, a sawmill, a barn, a winery, chicken coops, a small wooden building (some kind of tool shed? Outhouse?) too deep into its thick bracken island of decay, falling in on itself. This Mandarin waits hidden deep in Mandarin, within place without place or coordinates, traffic and chain stores interchangeable, but this Mandarin’s still here, because it was here, this Mandarin its own village downriver from Jacksonville now stays hidden deep inside uncentered suburban Mandarin itself inside interminable city limits of Jacksonville with its heart pulled out. iv) as though volunteers dressed like Confederate soldiers even touched the surface of place memory of this old farm. exactly 10 lumber carts. Ten lumber carts the equal in value of one man named Stephen. Stephen, where did you go? What did you say? And of you, Stephen, what else? And after the Civil War comes Harriet Beecher Stowe, “the little lady,” President Lincoln apocryphally said/or never said/take your pick, “who started this great war,” Stowe who wrote Palmetto Leaves about this village, years after writing the best-selling book of the 19th century. She grew oleanders, jasmine, pomegranates, crape myrtles, and of course, of course: orange trees. In seven years from planting, a dozen orange trees could average 300 fruits each. Freed slaves came out to field and grove and worked three hours before having breakfast. Colonel Lloyd kept a large and finely cultivated garden. […] It abounded in fruits of almost every description, from the hardy apple of the north to the delicate orange of the south. This garden was not the least source of trouble on the plantation. Its excellent fruit was quite a temptation to the hungry swarms of boys, as well as the older slaves, belonging to the colonel, few of whom had the virtue or the vice to resist it. Scarcely a day passed, during the summer, but that some slave had to take the lash for stealing fruit. We have had people tell us that the vexation of having fruit carried off was so great, that it took away all the pleasure of a garden.Now, no fruit is more beautiful, more tempting, than the orange. We live in an orange-grove surrounded by negroes, and yet never have any trouble of this kind. We have often seen bags of fine oranges lying all night under the trees; and yet never have we met with any perceptible loss. Orange trees all over Jacksonville, but the orange groves long ago moved South after devastating freezes in the 1880s and 1890s.